This is a small collection of all the jars that I have collected in the past 6 years. I hoard napkins, reusable takeout containers, and glass jars. I attribute the hoarding to my beloved grandmother. Well, maybe also to my great grandmother and definitely to my mother. It’s been in our family for generations and I know that it will probably get passed to my own daughter. As an immigrant family, I saw my grandmother skillfully refill glass jars with kimchee, soy bean paste, soups, herbal medicines, sometimes homemade wine, and even with some whiskey and a piece of some animal’s liver or heart. (Ask me about that later.) Nothing went to waste – the Styrofoam trays were gently cleaned and reused to hold rows and rows of Korean Mandoo (dumplings); the plastic grocery bags were neatly folded and would later be used to carry the jars of soups or kimchee to a neighbor; the jars – would replace the clay pots my grandmother once used in Korea to store kimchee, soy bean paste, red pepper paste, winter radish kimchee, and pickled cucumbers. I’m not even sure where she got these jars. Our house and refrigerator were full of them and so was my grandmother’s house. It wasn’t until I was packing up our house, in preparation to sell it, that I realized I had a huge collection of my own glass jars. As I put the glass jars in the recycling bag, I felt the weight of each one in my hand and thought about how my grandmother, great-grandmother, or mother would’ve filled them. I thought about how I carried on tradition when I filled these jars. Some of the jars were filled with a special seawood soup for new mother that Koreans swear by; others with pickled cucumbers, onions, and cloves of garlic for a cousin who was living on his own and craved some Korean flavors; and a few filled with a newly discovered banana pudding recipe because I didn’t have a trifle bowl. These weren’t just glass jars – these were representations of the community that surrounded me. This was how my immigrant family brought a small bit of Korea to me and taught me the importance of preserving our culture within the new culture that they lived in. This was how they showed love – filling my fridge on their visits with 3 different types of kimchee, 2 types of Korean soups, and a jar of my favorite pickled cucumbers. I reluctantly recycled my glass jars. I know that I will probably hoard many more in the next few months and restart my collection. After all, these glass jars are not just glass jars, but they are my family’s heart, my family’s traditions, and the stories and community that they pass on to me. This was so moving, Phyllis. My family has a similar obsession with paper bags – the handled shopping kind. Last year, my mom brought me some fruit in a bag from a museum in Boston. I’m the only person in my family who has ever been to Boston — and that was at least 20 years ago. I also recycled that bag, along with lots of other stuff, when we remodeled our house. It’s the memories that count, not the actual “thing”. Thanks Grace! Ooh – paper bags. I love that she brought it to you from a museum in Boston ala 20 years ago! I’m always surprised as to what comes back to me via my grandmother and mom! And yes, I have had to tell myself that it is the memories and not the thing a lot lately. I’ve also taken many pictures of things to remind me. They are my little tributes. I love this. Like you, I hoarded glass jars for a long time too. My dad had these huge jars where he’d soak some concoction from the herbalist in vodka or whisky. I actually save those big spaghetti sauce jars to pickle my own cabbage and other vegetables. Kim – it definitely is an Asian thing to hoard glass jars! 🙂 Yes – I always wondered all those things that were in whisky or vodka. I was fascinated by the herbalist. My grandfather (and probably my grandmother too, but she died before I was born, so I never witnessed it personally) was a HUGE saver too. He kept all of the little tabs that are used to close bread bags, and I never figured out what they could possibly be re-used for. 🙂 Such a nice remembrance of your history and culture. This is great! I’m not Asian American, but a similar “tradition” runs in my family with the very same thing – glass jars. My new husband doesn’t quite understand it, but he doesn’t say much about it(accept when he fears we are running out of room to put anything else). The quirks of heritage are a beautiful thing to cherish and reflect on. Thank you! This was lovely! I found this post via @HapaMamaGrace (and have added one of my essays about food, family and culture to your linkup). 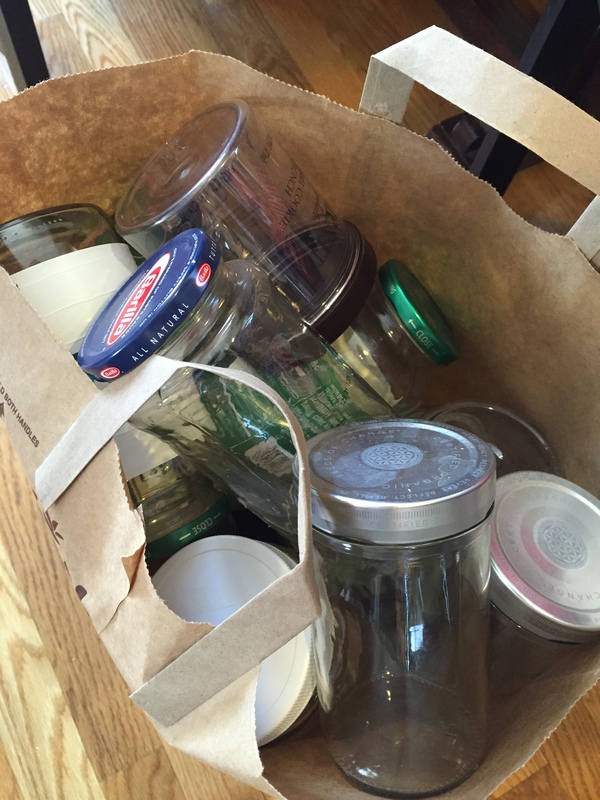 Bags, jars, also plastic takeout containers with lids– I think we all grew up with those kinds of collections. Of those, I have inherited the love of takeout containers– they are more leak-proof than actual Tupperware. When my grandmother passed away, my family uncovered a room in her house dedicated to saving everything — paper, jars. She had lived through the Depression and knew what it was like to want. Now, when I keep something like that, I wonder if I do it, in an odd way, to honor her. You just never know when you’ll need something…. Amazing! And yes, I am definitely feel like I am honoring my heritage with each glass jar I keep!